I love nettles. If stranded on a desert island, nettle would be one of my must have herbs. There are many species of nettle, the one we are most familiar with here in the United States is Stinging Nettle (Urtica dioica). Most people know this plant best from a childhood experience where they may have run through a wood and found themselves near a stream in a drift of plants that caused their legs to burn and itch. This leads many to think that they want to stay as far away from the plant as possible. Trust me, there is so much more to this wonderful plant than those childhood impressions. 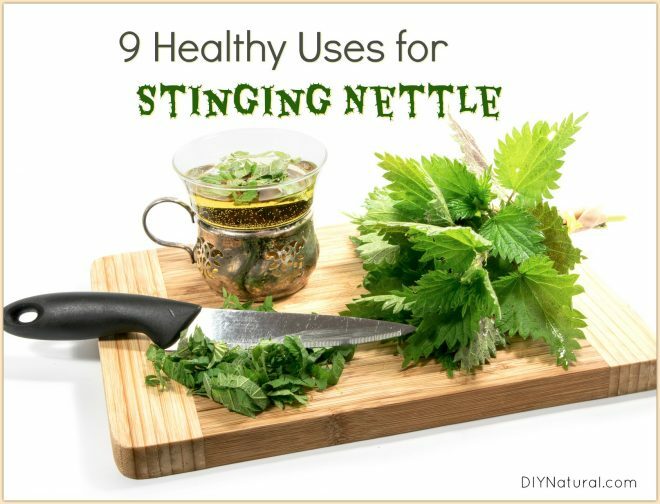 Nettles have many benefits and can be used in many ways. Here is another article on identifying, harvesting, and eating stinging nettle. Steamed and tossed with dressing, serve fresh nettles as a side dish. You can also combine nettles with chopped almonds and feta for use as a delicious salad topping. The taste of steamed nettles is like a cleaner, brighter, richer spinach. Nettles contain high levels of minerals, especially calcium, magnesium, iron, potassium, phosphorus, manganese, silica, iodine, silicon, sodium, and sulfur. They are very high in chlorophyll so its perfect when used to address low energy levels. Nettles are a good source of Vitamin C, beta carotene, and the vitamins in the B-Complex. They are one of the highest vegetable sources of protein. A superior tonic in pregnancy, this overlooked plant can help the body maintain circulatory health and appropriate hemoglobin levels during pregnancy. While one can drink a cup of nettle tea to help with gout and arthritis because of its diuretic properties, there are some who would use the fresh plant as an external remedy in these cases. Striking the offending joint with fresh nettles (known as urtification) causes a surface irritation that helps move away the pain-causing crystals stuck in your joints. A remedy for the brave at heart only! Did you know you can use nettle pulp to make paper? The plants are very fibrous and they make a beautiful base for homemade paper. Madame Grieve, the writer of one of our historical herbals, tells us that in 16th and 17th century Scotland the plants were highly sought after for the making of fiber needed for household goods. It is reported to be very high quality fabric, though a bit harder to process than something more commonly used today, such as cotton. Yep, nettle even has a historical place at the bar. Of the more crafty uses of nettles, beer and handmade paper are the ones I am most excited to try. How do you use nettles? Do you keep a supply of nettle at home for your health, or have you eaten it fresh? Share below! I use stinging nettle leaf tea and an equal amount of powdered horseradish root to make my allergy tea. I can’t drink the tea since it bothers my stomach. I use the horseradish root due to the fact that the tincture I have always used and have had great success with was actually called Nettle and Radish Tincture. I can’t buy the tincture in Nevada so I now make my own. If someone doesn’t like the heat they can use less of E the Radish in the tincture. I just prefer it strong. I truly wish I could drink the tea. Also on a personal not about Stinging from the Stinging nNettle. My older brother used to to scream from it stinging. I never had a sting ever. I also don’t get the fire from fire ant bites either. Love your great info on my fav allergy treatment. I’ve used the sting of stinging nettles to cure poison ivy and poison oak–it works! Fell into a patch as a child felt like I was burned, next day felt like a million bucks.I still remember the pain and the pleasure even after 30 yrs! When the nettles sting you, use the juice from jewel weed to relieve the itch!